Robe provided lighting for the annual PLASA 2017 trade show, staged at the Olympia exhibition center in west London over three days. In the center of the domed ceiling hall, Robe set up a high-impact stand, lit with their recently launched MegaPointe multi-functional moving light. The stand design and the live show’s direction and choreography was conceived entirely by Robe’s own creative team, led by Nathan Wan and Andy Webb. The show starred freestyle dancer Jake Stephens together with 42 x MegaPointes. 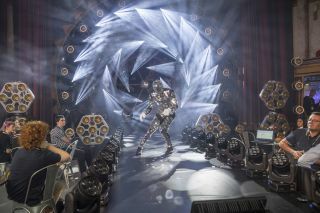 Jake’s 5 minute routine was performed in a custom designed mirror suit sourced in Belarus and chosen to accentuate the effect of the MegaPointes and the other new fixtures in the show, which included LEDBeam 150s, onePATTs, Divine UVs, Spiiders and pixelPATTs.